A move reportedly under consideration by the Trump administration to narrowly define gender based on a person's genitalia at birth could lead to lawsuits and threaten protections in education, employment and health care for some transgender Californians. "None of us were surprised by that memo," said Cecilia Chung, co-director of programs and policy with the Oakland-based Transgender Law Center. It's the latest move by the Trump administration to limit or repeal protections and rights for transgender people. In February 2017, the Education and Justice departments reversed Obama-era protections for transgender students to use the bathrooms that match their gender identities, and in July 2017, Trump announced that transgender people would not be allowed to serve in the military. According to the Times, "The Department of Health and Human Services has called on the 'Big Four' agencies that enforce some part of Title IX — the Departments of Education, Justice, Health and Human Services, and Labor — to adopt its definition in regulations that will establish uniformity in the government and increase the likelihood that courts will accept it." State Sen. Scott Wiener (D-San Francisco) expressed alarm about the report. "By defining gender as birth-assigned gender only, the Trump administration is trying to erase transgender people out of existence — consistent with the Administration's effort to erase LGBT people from health surveys and the census," Wiener said in a statement late Sunday. "This action will have profound consequences. More trans children will commit suicide. More trans people will be assaulted and murdered. Trans people will be less healthy and less visible," Wiener said. "Trump wants us to be invisible — to go away. We won't go away. And, California will continue to fully embrace our trans brothers and sisters and LGBT people generally," he said. Chung said the impact of the move would be blunted in California due to protections for transgender people in health care, education, employment and housing that are enshrined in state law. But, according to Chung, it could have other impacts, like making it harder for transgender people to access health services, such as HIV prevention and treatment. 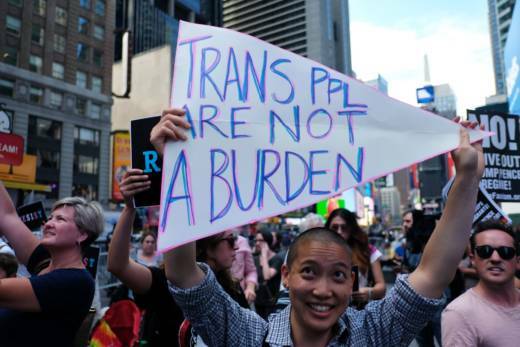 She said the Department of Health and Human Services allocates resources for those services based on which groups are most affected and changing the definition of gender to exclude transgender people would make it harder for them to be counted. "I don't think that it would make us extinct, but it would certainly make us more invisible," Chung said, "and in that case, it becomes an equity issue because you can't allocate resources to an invisible community." Chung said the potential change is most likely to have an impact in counties and cities that are more traditionally conservative, where schools in particular are less likely to have strong protections in place for transgender students. She said the Transgender Law Center is willing to go to court if the policy leads to discrimination in California schools against transgender kids, and she's confident that the change would be deemed unconstitutional based on previous court rulings. "I think the best analogy I can give is to see the administration as this big bully, and since the transgender and gender non-confirming community is a minority, that sets up this whole David and Goliath dynamic," she said. "But of course, in the end, we know that David wins. We are very confident that justice and the constitution are on our side." Diane Ehrensaft, director of mental health at UCSF’s Child and Adolescent Gender Center Clinic in San Francisco, said the administration’s stance would end up harming transgender children. “To tell them ‘You don’t exist and you can’t live your life accordingly, like using the bathroom to match who you are,’ is to increase the alarmingly high rates of risk that are there already,” she said. Ehrensaft said transgender kids who are not supported will frequently experience anxiety, depression and impulses to self-harm. On surveys, U.S. transgender adults have reported attempting suicide at a rate of around 40 percent. One local parent of a 7-year-old transgender girl said she was "horrified" by the language of the administration's memorandum. "For [transgender children] to have to hear the words coming from their government that were sent out yesterday is heartbreaking," said Molly, who lives in the East Bay and didn't want her last name used for reasons of privacy. "I just want them to know that they are seen and celebrated and loved, and they exist, and that there is no way they're going away." This story has been updated. Jon Brooks contributed to this report.